Netflix announced that they have exclusively licensed Season 1 of the hit TV show The Walking Dead for streaming. About five months ago we announced that Netflix would sponsor a sequel to the Netflix Prize. We've given a lot thought to how to sponsor a contest that discovers more about the predictability of Netflix members' movie watching behavior while always ensuring we protect Netflix members' privacy. In the past few months, the Federal Trade Commission (FTC) asked us how a Netflix Prize sequel might affect Netflix members' privacy, and a lawsuit was filed by KamberLaw LLC pertaining to the sequel. With both the FTC and the plaintiffs' lawyers, we've had very productive discussions centered on our commitment to protecting our members' privacy. We will continue to explore ways to collaborate with the research community and improve our recommendations system so we can constantly improve the movie recommendations we make for you. So stay tuned. Wired reports that AT&T will donate its share of the Netflix Prize winnings to local charities in the New York and New Jersey area (near AT&T). What a classy thing for AT&T to do. Netflix’s second $1 Million prize Contest will have scientists take on the even more difficult problem of recommending movies for customers that rate few movies, and this time will use demographic and behavioral data to predict customer rentals. The second Netflix $1 Million prize will be broken into two awards, with the leading team at 6 months and 18 months winning a $500,000 progress prizes. While the first prize focused on customers that rated more than 50 movies, the second contest will enable Netflix to more accurately recommend movies to customers that are just getting started or rate movies infrequently. More information will be available on the Netflix Prize website soon. Update: The top two teams submitted last-minute submissions, and it looks like The Ensemble team won by .01%, but Netflix has to review the submissions and declare a winner. With a million dollars in prize money at stake in the Netflix Prize contest, I'm not surprised to see a last-minute submission by The Ensemble that surpasses BellKor's Pragmatic Chaos with a 10.08% improvement. It'll be interesting to see if yet another team places a last-minute entry before the deadline at 18:42:37 UTC time today. 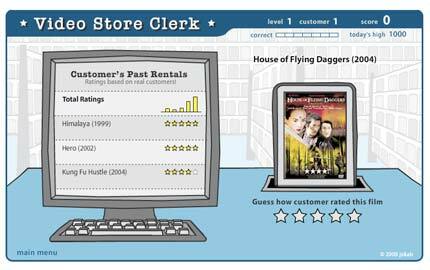 Video Store Clerk is an online game that uses humans to rank movies instead of computer algorithms. I'm assuming the resulting data will be used to compete for the $1 million Netflix Prize. "This game is part of an experiment to see if humans can be better problem solvers than computers. Your answers actually help the game get better results." It'll be interesting to see how humans do against computers. Anand Rajaraman's students at Stanford are working on the Netflix Prize in his data mining class. Did your homework ever give you a shot at $1 million dollars? KorBell, a group of AT&T Bell Labs researchers, have won the $50,000 "progress" award in the Netflix Prize Contest (which means that the $1 million grand prize is still up for grabs). The KorBell team of Yehuda Koren, Robert Bell, and Chris Volinsky, who work on visualizing and analyzing large networks for AT&T in Florham Park, N.J., improved upon the Netflix recommendation system by 8.43 percent. They led a crowded field of more than 27,000 contestants on more than 2,550 teams from 161 countries. Koren, KorBell's captain, said he is an enthusiastic Netflix member who was drawn to compete for the Netflix Prize after the Netflix Prize dataset gave him an "opportunity to study a fascinating network." Koren said he and his team spent 2,000 hours in data analysis and computation to come up with the highest improvement to date over the Netflix recommendation system. Results of the team's work will also apply to AT&T Labs' ongoing research and development efforts to enhance the company's network and communications and entertainment service portfolio. The press release has more details about the news. Paul Harrison on Logarithmic.net has decided to share his approach to winning the $1 milion Netflix Prize, How to get an RMSE of 0.8937 in the NetFlix Challenge. The current NetFlix leader has an RMSE of 0.8847, which my approach won't be able to beat no matter how much computing power I throw at it. There is therefore no longer a reason for me to keep my approach secret. I did my calculations using Python and a small amount of inline C++, using the Numpy and Weave libraries. My approach is based on simonfunk's SVD method. That is, we predict a user's rating of a movie by taking the dot product of two vectors, one corresponding to the movie and one corresponding to the user. Are you working on the Netflix Prize? I'd love to hear your story. Can A Philosopher Win the Netflix Prize? With an additional 3.87 percentage points yet to be racked up, the road to victory is long – possibly impassable. If I understand my statistical modeling correctly, every unit of progress to 10 percent will be a far tougher slog than the one before it. There clearly needs to be a breakthrough in how the problem is approached if anyone has a chance of winning. A couple of days ago, it occurred to me that the source of this breakthrough might be a better ontology. Ontology is the study of logically structured categorical models. It helps us understand a particular domain of reality by looking at its essential elements, and especially, how they are interconnected. Because ontology proposes to explain big complicated things, this discipline was honed first by philosophers. The Wikipedia has an article about Ontology.